The weekend is almost here but you were too busy to plan ahead. The family wants to do something new, but it’s the height of tourist season in the mountains, that concert in Denver is sold out and you know if you stay home, you’ll end up doing chores. What to do? How about a Golden day trip or overnight getaway? Colorado’s original state capital is an easy hour-and-a-half drive from Fort Collins and with it’s lively downtown, biking, hiking, history and family fun, you can still score a perfect Colorado day or weekend without having to plan ahead. Why Golden? This charming college town sits on the edge of the Rocky Mountains and is home to a beautiful and historic downtown that is well known for the beloved welcome arch that spans its main street and says “Howdy Folks! 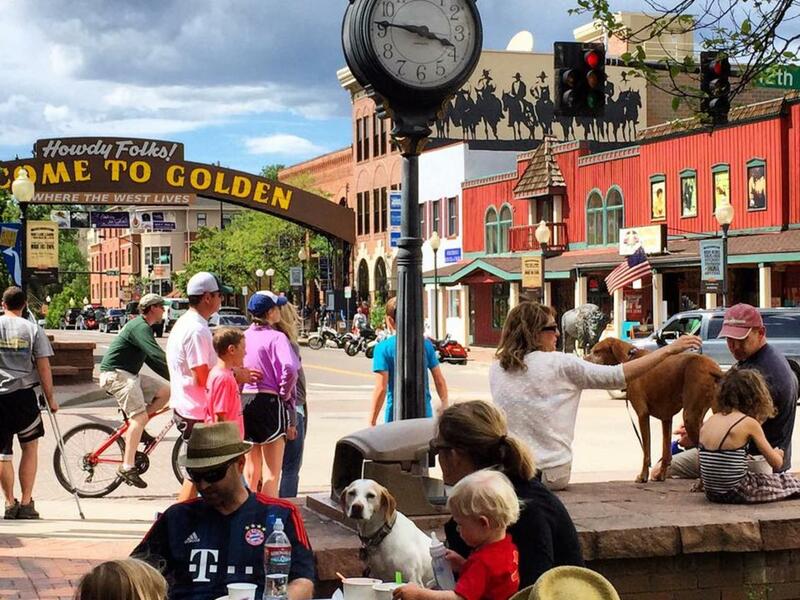 Welcome to Golden.” Gorgeous Clear Creek runs through the center of downtown, there are tree lined bike paths and a free bike library, nearby hiking trails, farmer’s markets, street fairs, museums and more. Plus, if you’re from Fort Collins, you probably appreciate beer. 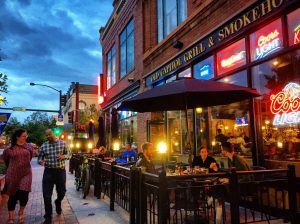 Fort Collins has Anheuser Bush and some of the largest and best-known craft breweries, such as, New Belgium and Funkwerks. Golden is home to the world’s largest single site brewery, Coors, as well as some of the state’s smallest craft breweries including Golden City Brewery where the beer garden is literally in the brewer’s backyard. 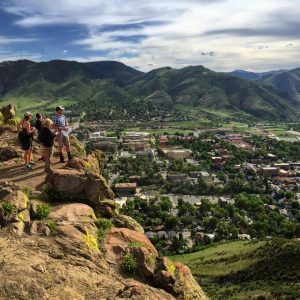 But before you enjoy that beer, here are seven Golden activities that Ft. Collins folks will love…. 1. There’s a Mountaineering Museum! We kid you not – an entire museum dedicated to hiking, climbing and mountaineering! The Bradford Washburn American Mountaineering Museum is the first and only museum in the United States that celebrates the heroism, technology, culture and spirit of mountaineering. There are exhibits about climate, the science of mountains, Colorado’s 14ers, lightning, and the history of mountaineering in both Colorado and around the world. The clothes worn by the first Americans to summit Mount Everest are here, as are 5,000 other items, photos, outfits and cultural artifacts. On display is an ice axe that once saved five lives, a huge model of Mount Everest, showing the many different ways the peak has been climbed, and where some of its most famous tragedies have occurred. There’s also an exhibit on the famous 10th Mountain Division, regular films, discussions with climbers and other events, all right in the heart of downtown Golden. 2. No need to haul your bike; Golden has one you can borrow – for free! The Golden Bike Library (located conveniently in the Golden Visitor Center) has 40 bikes available for free two-hour rentals, Thurs.-Sun. Pedal down the Clear Creek Bike Path, a flat, paved, off street trail that follows the beautiful river for miles up into the mountains or downstream to Denver. Or bike to Golden’s breweries – they’ll even give you a map for that! 3. Visit Buffalo Bill’s grave, check out quilts, view art galleries & step back in history! Golden is home to ten museums including: Buffalo Bill’s Museum & Grave, the final resting spot and museum dedicated to the life of the American West’s most famous character who was a buffalo hunter, Pony Express rider, scout for the U.S. Army, and the showman who essentially brought the West to the rest of the world; the Rocky Mountain Quilt Museum, which showcases the scope of quilting, from bedcoverings of the 1800’s to contemporary art pieces; Foothills Art Center, a regional art powerhouse housed in a Gothic style church and Queen Anne manse. Definitely make a stop at Clear Creek History Park, where you can walk among the park like setting that houses an historic one-room school house and settler’s cabin. 4. Ride a train back into history. It was the railroads that won the West, and there’s nothing like hearing a steam whistle echo off the mountains, especially in January where the cold air makes the billowing mountain of steam rise that much higher into the mountain air. The Colorado Railroad Museum has a half mile circle track – sort of a giant’s toy train set – on which they run steam locomotives and the famous Galloping Goose – a 1928 Pierce Arrow limousine put on train wheels with a bus welded on the back. It’s the only way to fly – on wheels. 5. Bike Lookout Mountain -- or just go for a scenic drive. Featured in the U.S. 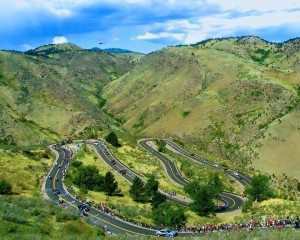 Pro Challenge, this is one of the most famous hill climbs on the Front Range. The paved road snakes, twists and turns, climbing 1,300-feet in 4.3 miles, from historic downtown Golden to the 7,379-foot summit of Lookout Mountain. The scenic road was designed by Frederick Law Olmsted, Jr., the son of the famed landscape architect who created Central Park in New York. It was built in 1914 as part of the Lariat Loop Scenic Byway, a series of early scenic paved roads that connected the famed Denver Mountain Park system. Today, there are far more cyclists than cars. While it is a challenging climb with 5-6 percent grades, bikers are rewarded with incredible views of Golden, the foothills and the far off snowcapped peaks. At the top, stop at Buffalo Bill’s Museum & Grave for a historical tour, or at least a cold drink in the museum’s snack bar and gift shop. Cyclists can zoom back down the mountain, or continue on a 15.5 mile loop trip, which includes views of a genuine buffalo herd. If that sounds like too much on your thighs, you can drive it and enjoy the views and fun from the comfort of your car! 6. Pub crawl through the world’s biggest little beer town. While you can argue over who makes the BEST beer, there’s no doubt who makes the most. Golden brews more beer than any other city in the world. Start with a free tour at Coors Brewery – the largest single brewing site in the world, than head to Golden’s six craft breweries, three of them within walking distance of Coors. Or pick up a free bike rental at the Golden Bike Library and bike to the other three. 7. Sit on a Golden patio, shop in a locally owned store & enjoy Golden’s small town charm. Golden’s downtown features outdoor patios, quaint coffee shops, a wide array of restaurants and dozens of locally owned galleries and shops selling clothing, gear, toys, artwork and more. Grab a coffee from Windy Saddle or frozen yogurt from Goozell’s and walk through downtown, enjoying the atmosphere. Eat lunch on the patio of Woody’s Wood Fired Pizza or go upscale on Indulge Wine Bistro’s patio while watching the laid back Golden scene unfold in front of you. Pick up a gift for the kids at Golden Goods, which sells old-fashioned toys and games. Golden and Fort Collins. You’ll feel a world away but it’s only a short drive you can make on a moment’s notice. Best of all, you’ll be able to take on all your favorite activities in a new place. For more info, check out visitgolden.com.